Your home is one of the biggest investments you will ever make, and products like house siding, gutters and roofing are some of your first lines of defense in protecting your home from heavy weather, rot, and even rodents. So, when you choose an exterior for your home, you want to be sure you’re getting a durable product that will protect your house from the harsh Midwest elements while enhancing the value and appearance of your home. At ABC Seamless, we sell and install a wide range of products, from house siding to gutters, which are superior in quality, durability, and beauty to virtually any other products on the market. Most home improvement companies offer wood or vinyl house siding, asphalt roofing, and other products made with materials that are prone to warping, fading, and cracking. Plus, most of those other products need constant painting, replacing, and maintenance! At ABC Seamless, we manufacture our products and they are made of steel. Steel offers superior protection from moisture, wind, and other elements and can last indefinitely. Additionally, our steel products feature a chip- and fade-resistant coating, so our house siding, roofing, and gutters are maintenance free. 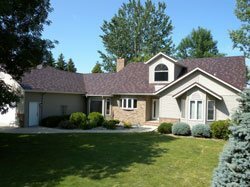 At ABC Seamless, we offer much more than just home siding, roofing, and gutters. As your number one source for home improvement, we also provide energy-efficient composite replacement windows, beautiful entry and patio doors, and custom built TEMO sunrooms and pergolas. Whether you need house siding, a sunroom, or another top-quality product for your home, with ABC Seamless, you’re working with a company that puts the customer first. Our associates aren’t salespeople – they’re home improvement consultants who are highly knowledgeable, will assess your needs, and will recommend reliable products that are best suited for you and your home. We have an A+ rating from the Better Business Bureau and have been ranked among the Top 500 home improvement companies by Qualified Remodeler Magazine. For more information about durable, seamless house siding, replacement windows, sunrooms or any of our other exceptional products for your home in Omaha, Lincoln, North Platte, Wood River, or beyond, please contact us today!